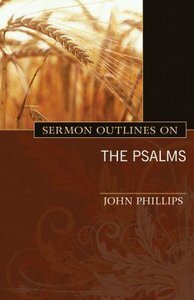 Acknowledged by many as the master of biblical outlining, John Phillips provides the busy pastor or teacher with a treasure trove of insight and alliterative gems in Sermon Outlines on the Psalms. Some outlines can be used to develop a single sermon while others provide the framework for a series of messages from one psalm. "John Phillips writes with enthusiasm and clarity, . . . cutting through the confusion and heretical dangers associated wit Bible interpretation." "In the style that has commended him to numbers of Bibleloving people, [Dr.] Phillips deals with . . . biblical exposition in Christ-honoring, easily read style." About "Sermon Outlines on the Psalms"
John Phillips served as assistant director of the Moody Correspondence School as well as director of the Emmaus Correspondence School, one of the worlds largest Bible correspondence ministries. He also taught in the Moody Evening School and on the Moody Broadcasting radio network. Now retired, Dr. Phillips and his wife, Betty, live in Bowling Green, Kentucky. He is the author of numerous books including the well-known Exploring Series.